—Aristotle, “The History of Animals,” c. 350 B.C. The Whip-poor-will is a bird of many distinctions. The Whip-poor-will also has a marvelously eerie scientific name: Caprimulgus vociferus, literally “noisy goatsucker.” Unlike the mythic Chupacabra, birds of the genus Caprimulgus, to which the common nighthawk also belongs, were not believed to drain the blood of goats, but to drink their milk instead. This is, if you ask me, a more palatable proposition: but it is equally fictitious. Aristotle himself—an august thinker, to be sure, but wrong about so very many things—thought this to be true. The story may have arisen because of the birds’ incredibly wide bills, which apparently looked to ancient observers as if they would be very useful for sucking at goat teats. In fact, what those bills are suited for is gaping open in flight and snatching up large insects, which are what make up the majority of the Caprimulgus diet. In sum, the Whip-poor-will is a medium-sized, ground-nesting, nocturnal bird with beautiful mottled plumage consisting of a complex pattern of browns, grays, blacks, and whites: a confusion of earthy colors that makes it almost invisible when still. And it is very, very beautiful. 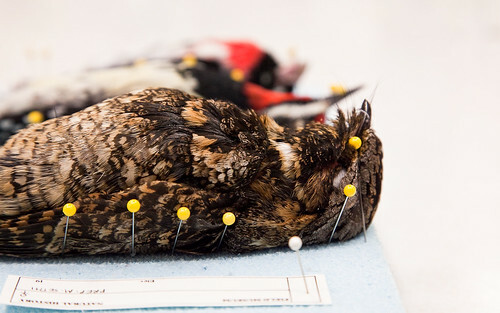 I can tell you quite confidently just how soft that pretty plumage is—it is as downy as an owl’s—because I spent an hour and a half skinning a lovely little female Whip-poor-will this morning in the Field Museum’s bird prep lab. The number on her tag began with the initials “FC,” which means she was collected as a wounded bird by the Flint Creek Wildlife Rehabilitation Center in Northerly Island, Chicago, and unfortunately didn’t make it. In fact, as I was handling her I noticed that her right humerus was broken, probably the injury that brought her to Flint Creek. Here she is. Dave, the collections manager in the Bird Division, was very happy to have her as a study skin; I don’t think we see too many Whips in the lab. This entry was posted on June 3rd, 2010 at 7:29 pm and is filed under Shorts. You can follow any responses to this entry through the RSS 2.0 feed. Both comments and pings are currently closed. Based on the recording in the link, I’ve just been trying to figure out what I would have called the bird had I, too, named it after its sound. Possibly “wipparee” or “wipparit” or some variation thereon. Or perhaps “wipparick”, which I think is a slightly prettier-looking word. Anyway, I agree with the first syllable but don’t see how anyone got “poor-will” from the latter two.